Experience the unparalleled thrill of freefalling for up to 1 minute at awesome speeds of approximately 200kph during a tandem skydive. The Accelerated Free Fall (AFF) skydiving course is the most comprehensive introduction to sports skydiving and consists of nine stages plus a minimum of 5 solo jumps to obtain your internationally accepted A Licence; a total of 14 skydives. The ground training, classroom work and skydiving take place at the Euroa Drop Zone. Once you have demonstrated an understanding of the skydiving skills learnt during your ground training you can progress to a skydiving jump wearing your own parachute and with two skydiving instructors, one on each side of you. They are there to hold on to the grips on your jumpsuit to help maintain your stability during freefall and to check your altitude awareness before deployment. Once you have successfully deployed your parachute you will commence the final stage of your skydiving adventure – landing. You'll have clear air to fly through while you're guided back to earth by your Target Control Officer (TCO) on the ground. Your skydiving parachute system, specially designed for skydiving students, comprises a ram air main canopy, a ram air reserve canopy and an Automatic Activation Device. Once the skydiving course is over, the sky's the limit! Stage 2 - 10,000ft This stage is a solo skydive, assisted by two instructors. In this jump you will learn about Freefall manoeuvrers. You will also consolidate your skills for height awareness and further aspects of piloting your canopy. Stage 3 - 10,000ft During this stage you will learn how to Freefall solo, and keeping a heading. Skills learnt from previous stages will also be practiced and you will learn the importance of good body positioning while freefalling, and continue with more aspects of piloting your canopy. Stage 4 - 10,000ft If you feel ready, this jump will be done with only one Instructor. He will let you go when you are ready so you can start to learn to fly on your own. Yahoo! Stage 5 - 10,000ft This stage is done with one instructor and the exit may be done unlinked. You will learn 360 degree turns and forward movement and re-linking up with your instructor. Stage 6 - 10,000ft This jump is similar to stage 5 and is a consolidation dive to improve on previous performance. The exit will be unlinked. Stage 7 - 10,000ft For this stage you will learn how to do a dive exit which is done unlinked. 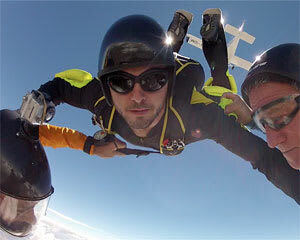 You will learn how to do back loops and one of the most important skills in skydiving, tracking. Stage 8 -10,000ft This jump will demonstrate the concept of flying "relative". You will learn how to do fast and slow falling by changing your body position. You will practice skills such as turning and back loops. Your ability to track will be tested, you are required to perform an "S" turn during your track. Stage 9 (4,000ft and 3,000ft) These will be your first jumps leaving an aircraft from a low altitude. Known by skydivers as a "hop and pop", they will be a slightly different experience than what you are used to. You will have a three-second delay before pulling your ripcord. This will familiarise you with getting out of a plane closer to the ground. To obtain your "A" licence you must complete 5 Solo Jumps, complete the Freefall course, learn to pack a parachute, complete a written exam and land 10 times within 25 metres of a designated target - all of these things are easily achievable with the professional training you are given. On 13th & 14th December we completed Stage 1 AFF course at Skydive Melbourne Euroa. From the beginning Ian was very helpful with confirming dates for the course and giving information. At the drop zone the staff were friendly, helpful, professional yet quirky and very funny. The AFF course was great! Full day Saturday in the classroom also equipment exposure and exercise sequences to learn. Sunday was jump day!!! With many tandem jumpers arriving the Skydive Melbourne Euroa team were ready & well organised. Everything went smoothly and there were many very happy people enjoying Euroa drop zone. I would not hesitate to recommend Euroa Skydive to anybody who is looking for an Adrenalin gift to give! Thanks Ian & the crew for a great weekend.